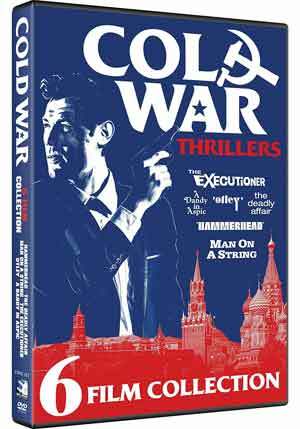 MAN ON A STRING (1960) — Renowned director Andre De Toth actually got permission to go into East Berlin and Moscow to film this Cold War thriller, based on actual events. Ernest Borgnine plays a Russian-born movie producer whose background makes him an ideal counterspy for the “CBI.” He agrees to the deception, and, aided by agent Avery (KERWIN MATHEWS), he pretends to defect – but how long can he kieep up the charade? THE DEADLY AFFAIR (1966) — A cold war thriller based on a novel by John Le Carre. British secret agent Charles Dobbs (JAMES MASON) is puzzled by the sudden suicide of a man he’s recently investigated. The suicide seems contrary to his own findings, and Dobbs questions the recent widow (SIMONE SIGNORET) in an effort to understand the man’s state of mind. When the Foreign Office tells Dobbs to drop the inquiry, he persists, even enlisting a retired investigator when he turns up further disturbing evidence. All of this takes place while Dobbs is dealing with the news that his frequently unfaithful wife (HARRIET ANDERSON) has been carrying on an affair with his friend and protégé (MAXIMILIAN SCHELL). OTLEY (1968) — Born loser Gerald Otley (TOM COURTENAY) is a freeloader living off the nearly exhausted kindness of friends and former lovers. One night, Otley is drunk and awakened when his host is murdered. The next morning before the police arrive, he is kidnapped by a beautiful woman he met the night before (ROMY SCHNEIDER). Realizing he’s in the midst of an espionage conspiracy and also wanted for murder, Otley stumbles from one near-crisis to another, unable to extricate himself or distinguish friend from foe. A DANDY IN ASPIC (1968) — This stylish ‘60s espionage thriller bounds between London and Berlin, following cool and inscrutable Alexander Eberlin (LAURENCE HARVEY), a British agent tasked by MI-6 with finding the double-agent in their midst, Unknown to British Intelligence. Eberlin in the Soviet Agent. When the Soviet contact is eliminated, Eberlin is running for his life. Eberlin is tracked closely by his partner Gatiss (TOM COURTENAY) an agent-assassin who despises him and is suspicious at every turn. Complicating matters is the flighty but sincere Caroline (MIA FARROW), who enters Eberlin’s life, but Eberlin’s created a web so tightly wound about him that he no longer can be sure who to trust. HAMMERHEAD (1968) — Hammerhead (PETER VAUGHN) is the international criminal. Hood (VINCE EDWARDS), the American spy sent to intercept him before he can acquire nuclear secrets. This 1960s’ espionage thriller features girls aplenty, international locations and plenty of style. THE EXECUTIONER (1970) — When a covert operation in Vienna goes awry, British Intelligence operative John Shay (GEORGE PEPPARD) suspects his colleague, Adam Booth (KEITH MICHELL), may be a double agent. Despite help from his girlfriend, Polly (JUDY GEESON), a clerk at MI6, Shay fails to convince his superiors of his theory. Undeterred, Shay learns from scientist Philip Crawford (GEORGE BAKER) that Booth has been trying to steal top-secret documents. Appointing himself executioner, Shay kills Booth and then assumes his identity to obtain conclusive evidence that Booth was a traitor, only to discover the dead man’s wife (JOAN CRAWFORD) is now Crawford’s mistress, and Soviet Intelligence has set him up. While none of these six films look exactly spectacular, they were at least respectable enough, which goes for the Dolby Digital Stereo tracks that accompany all of the movies. Considering each disc has three movies, they came out pretty well, all things considered.